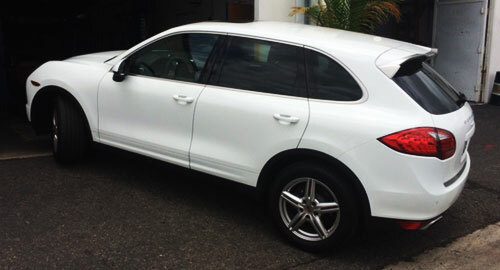 Rely on Cape Auto Repair for all of your Porsche Cayenne service and repair needs in Orange County. With decades of experience, we've become experts at maintaining and repairing all Cayenne SUVs made since 2002, including the Cayenne Diesel, Cayenne S, Cayenne S E-Hybrid, Cayenne GTS, Cayenne Turbo, and Cayenne Turbo S. We pride ourselves on our reliable workmanship and always take the time to educate our clients about issues that Cayennes are prone to, such as coolant leaks. Our prices are very fair and we offer free vehicle inspections with every service visit to help our clients protect their vehicles from major repairs and costs. Established in 1979, Cape Auto Repair has the experience, knowledge, and skills necessary to provide Cayenne owners with comprehensive service, including but not limited to oil changes, filter changes, brake service, electrical repairs, wheel alignments, engine rebuilds, transmission service, suspension repairs, clutch repairs, and more. We have worked on thousands of Porsches throughout Orange County and work hard to complete our high-quality repairs in as efficient and timely a manner possible. We include a one-year warranty on parts and labor with every repair, and keep our prices significantly less than those of any local Porsche dealership. Call Cape Auto Repair today and schedule a service, repair, or maintenance appointment for your Porsche Cayenne. We have earned many repeat customers throughout Orange County who count on us for our honest advice, fair business practices, and reliable repairs. We'll never upsell you on unnecessary services and work hard to fix issues correctly the first time, every time. We prioritize our customer's time and offer loaner vehicles and pickup/delivery services.